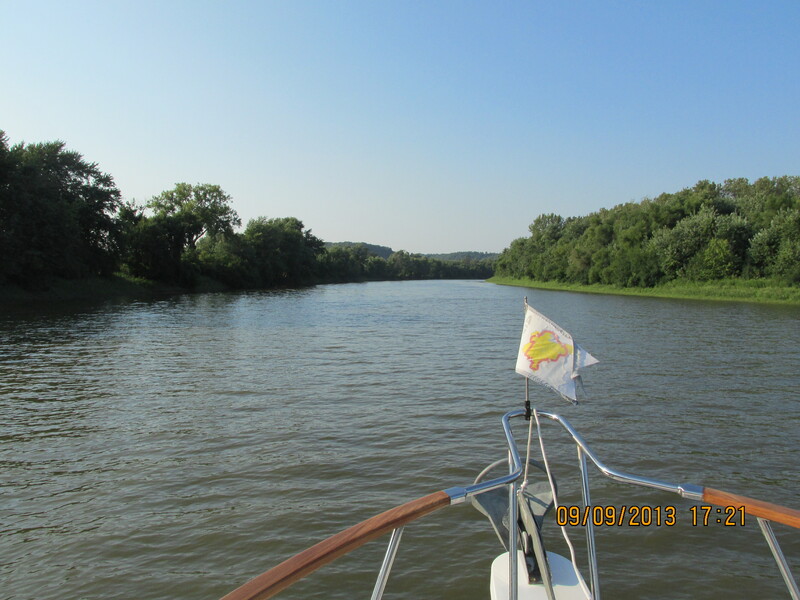 We left Harborside Marina on a calm and sunny day, heading south on the Illinois River. 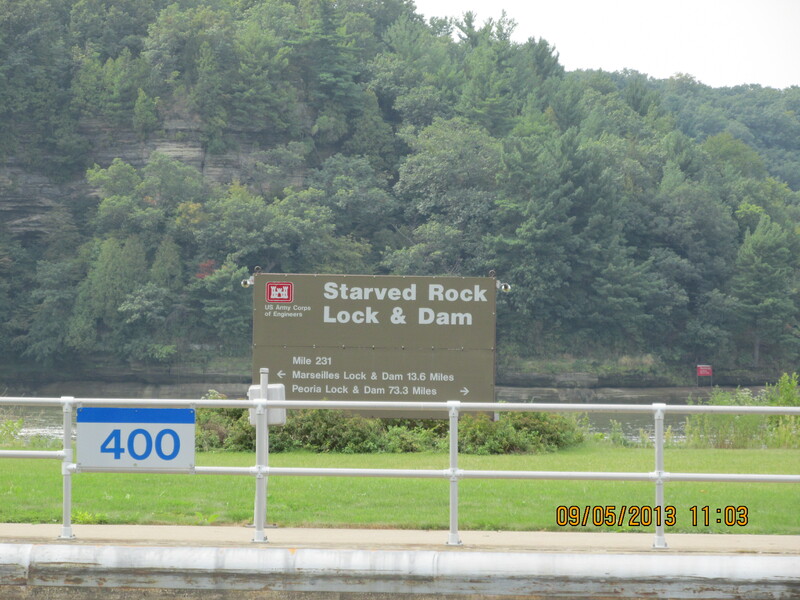 Went thru two locks on our way to Ottawa, IL. It was a beautiful run with plenty of bald eagles and herons. Holy Carp. 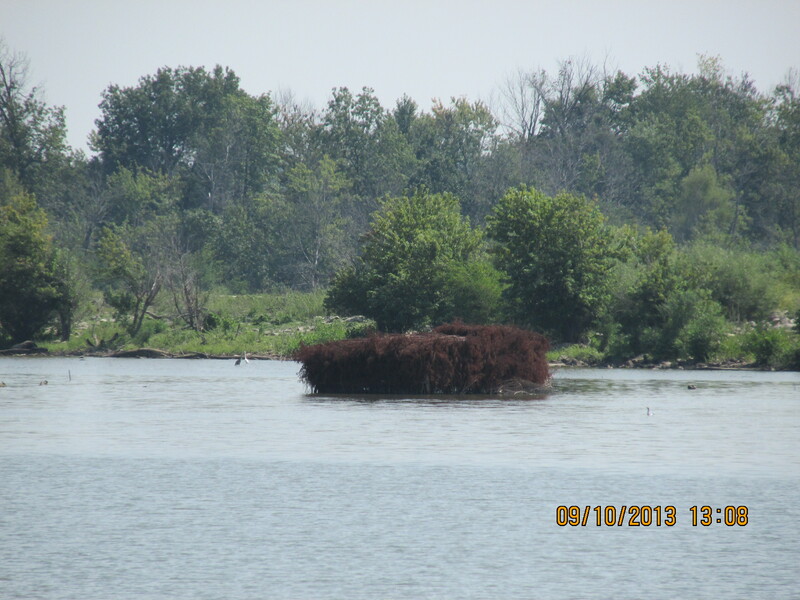 The funniest thing on this leg was when we were coming in to the pier at Ottawa, we ran over a school of Asian Carp and they jumped over the stern and on to the boat. I was so shocked that I screamed when they started flying everywhere. Of course, I did not have my camera as we were preparing to dock. Dad and Tom were just as shocked as I was, but they were on the fly bridge and did not get splashed by these huge fish. We talked about it for days!! This little town was a cute town. Tom and I walked around all three blocks of it and got an ice cream and did grocery shopping. Woop woop. We left the next morning heading to Henry, IL. Only one lock to go thru today. A tug with nine barges had to come thru the lock before we did and the lock was not big enough for the tug to go with the barges, so they locked the barges thru and then moved them forward with a cable. 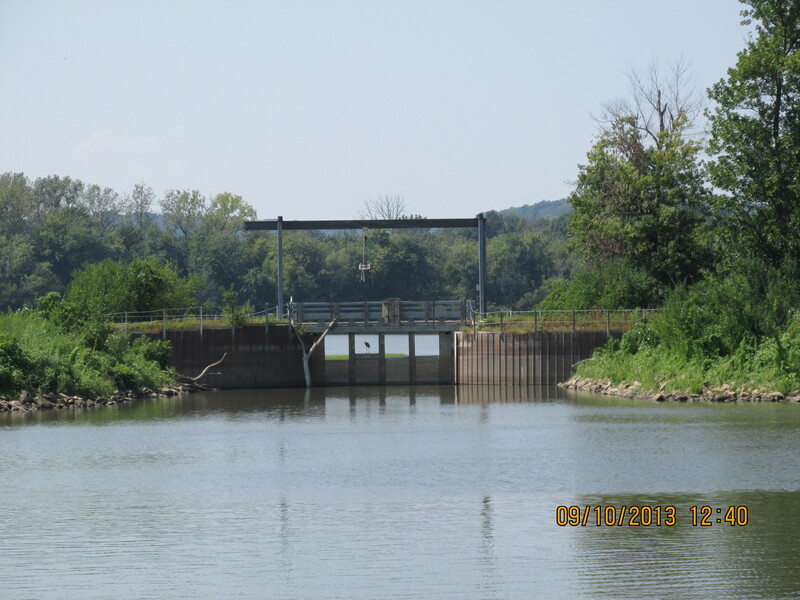 We had very minimal space to squeeze through the lock wall and the back side of the barges. The lock master kept insisting we come on thru so we squeezed by to get in the lock. 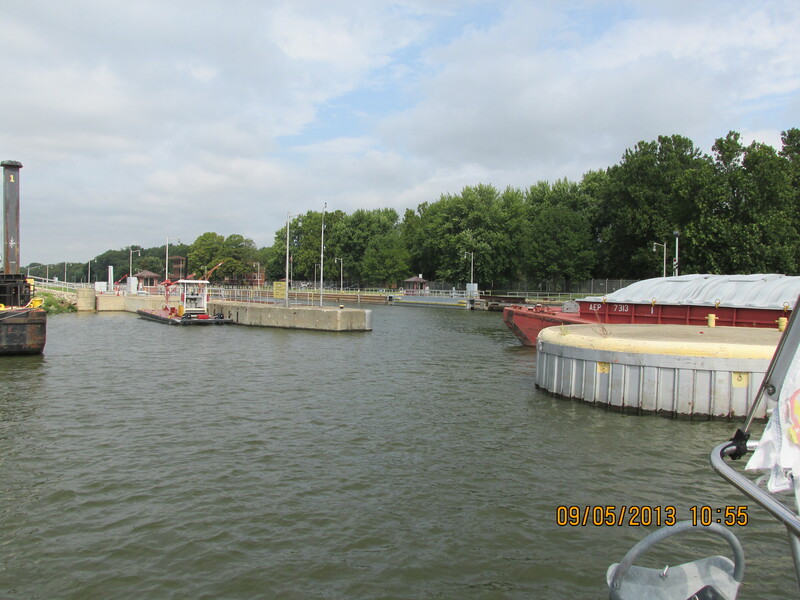 After we locked down the tug was able to lock up to get to his barges. What a disappointment Henry was. It was probably the worst place we have stayed. We were supposed to tie up to this old lock. When we got there, I had to jump off the boat to be able to tie us up. There were not cleats, only these small re bar eyes that were sticking up from the rock. We did have electricity, but it was not worth the money we paid. I was very disappointed. 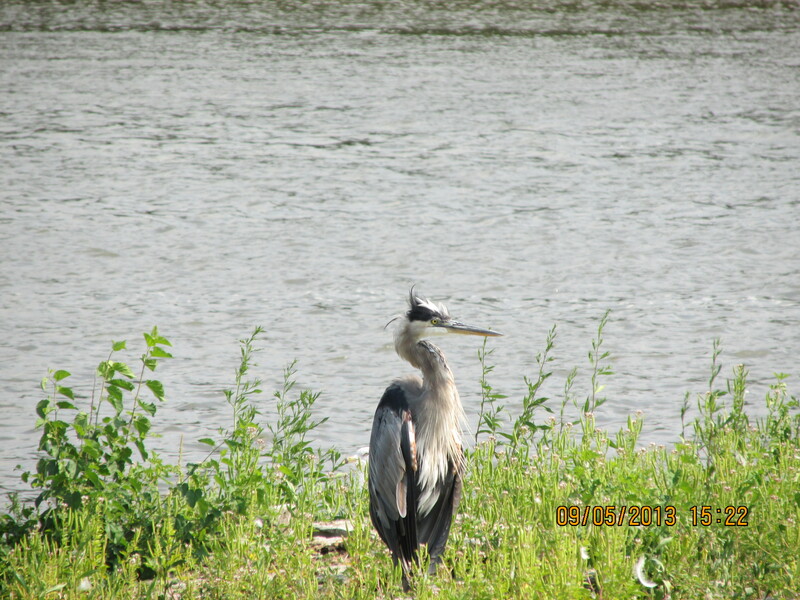 this stately heron was the only good thing at Henry. 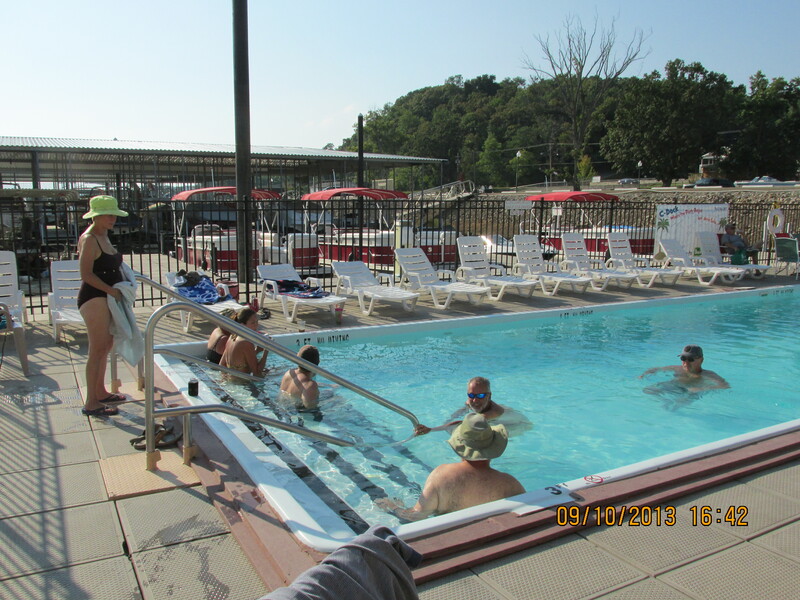 The next day we went on to the Illinois Valley Yacht Club which was a nice place. We did have to walk a mile to the restrooms, but it was still a nice place. 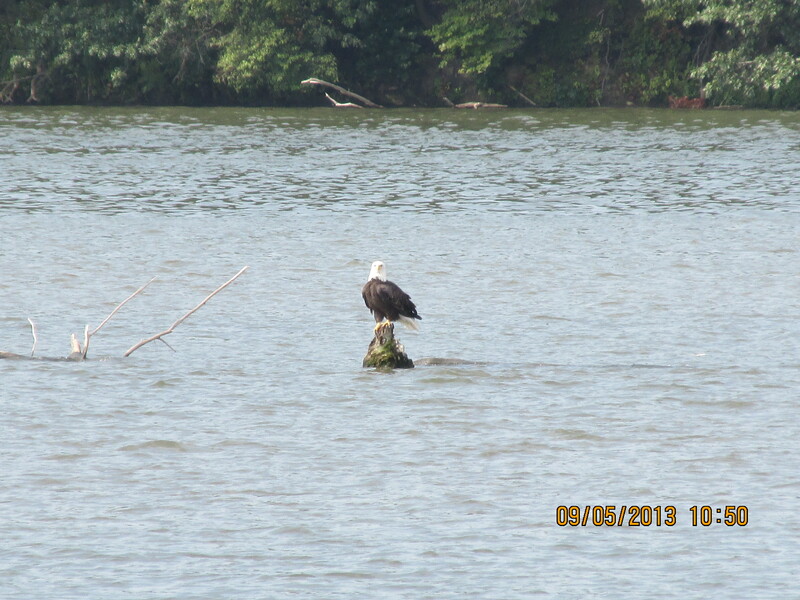 We saw a dozen bald eagles on this leg. They were magnificent. 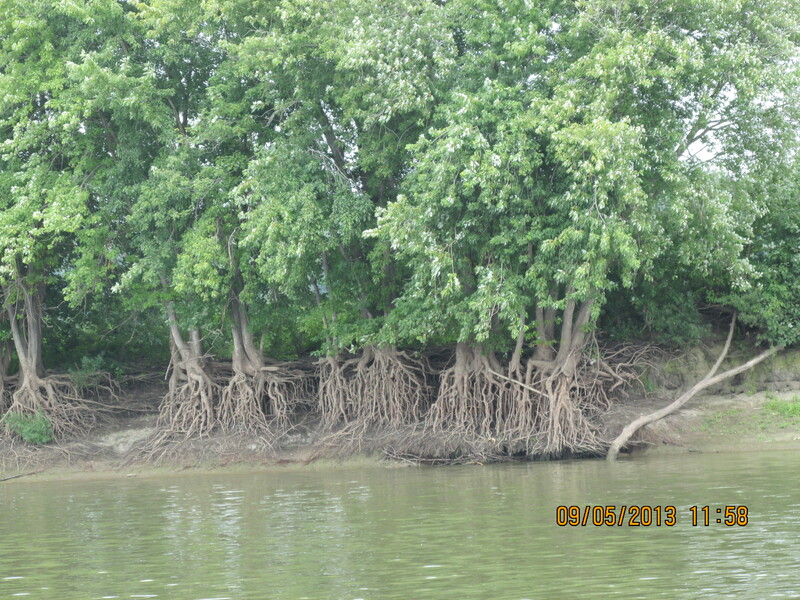 All along the bank were these trees that were almost completely out of the ground. There were a couple of miles like this. They were very interesting. 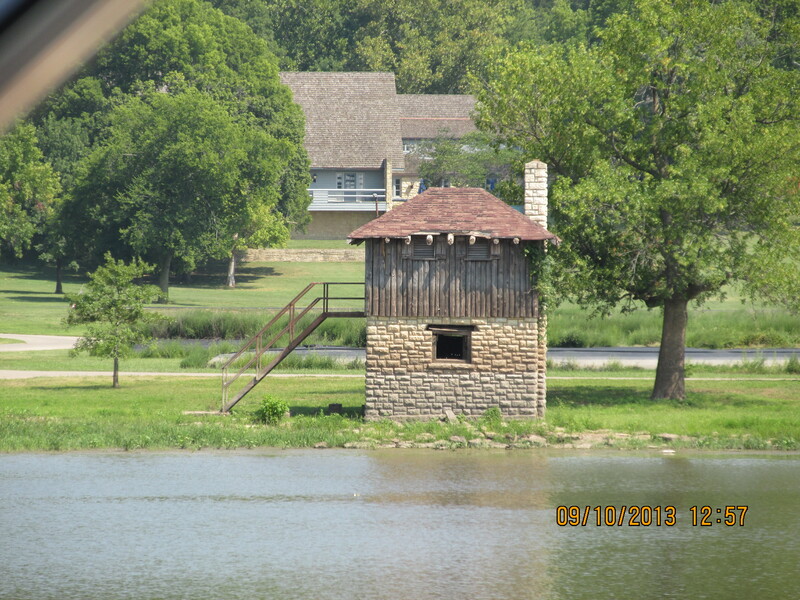 From the IVY Club, we went to a little marina called Tall Timbers, in Havana, IL. I was so worried that we were not going to get in and we would have to anchor out in bad weather. Bob, the owner, was so gracious though, and let us stay there two nights. I was able to do laundry and we all three walked in to town for their Octoberfest. It was a long walk for Dad, but he is a trooper and did great. While we were there, Tom had Asian Carp jump up on the pier, right at his feet, on two separate occasions. He took one in to show Dad, so we would believe him!! Bob told us that there was now a market for them. If you can eat them when they are fresh, they are good. So, all the tales we have heard about the carp jumping on your boat by the truckload, are dying down, as fishermen are catching them now to sell. The next day we ran about 80 miles to a nice little anchorage behind Wing Island. Well, I said it was nice, but it was a bear to get in to. We had gone longer than we intended and it was getting late, so we decided to anchor just off the channel. It was marked on the chart as a good anchorage. We pulled around the tip of the island and it was much more shallow than was charted. We touched bottom and Tom immediately backed down. It took probably 30 minutes to find a spot Tom liked and anchored for the night. It was so hot (around 97) so Tom was going to grill out instead of turning on the stove. We were watching TV and he kept going in and out to the grill. The genny was on so we had a/c. We did not realize, until later that night, that a million bugs were coming in every time he opened the door. When we turned on a light that night, they all gathered around in hoards. Tom spent the next 15 minutes killing bugs. When we looked outside the windows were covered in bugs. We had never seen anything quite like it. Pretty creepy. 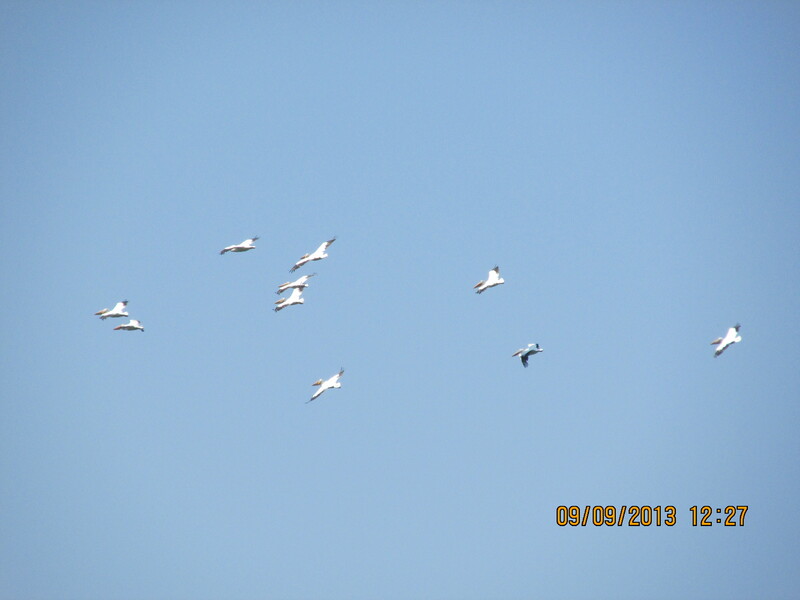 I know you can’t see these well, but they are white pelicans. 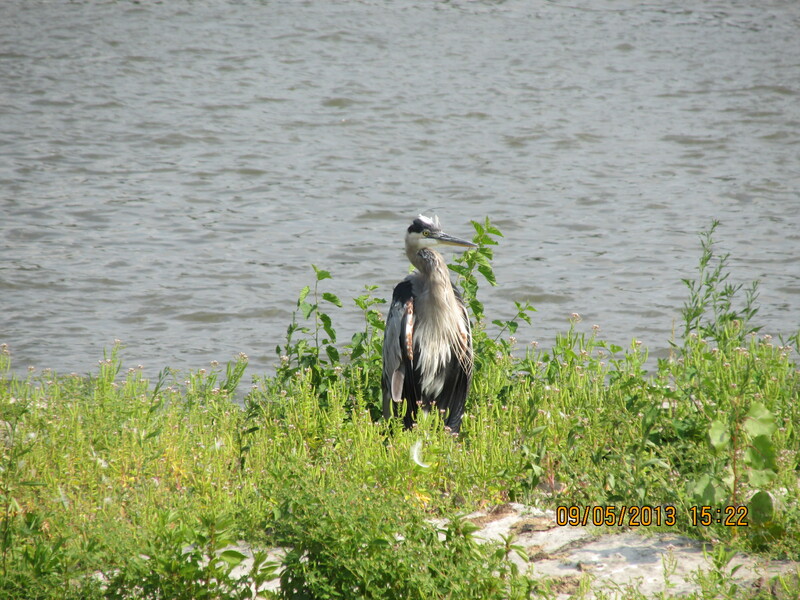 We have brown pelicans in North Carolina, so this was pretty to see. 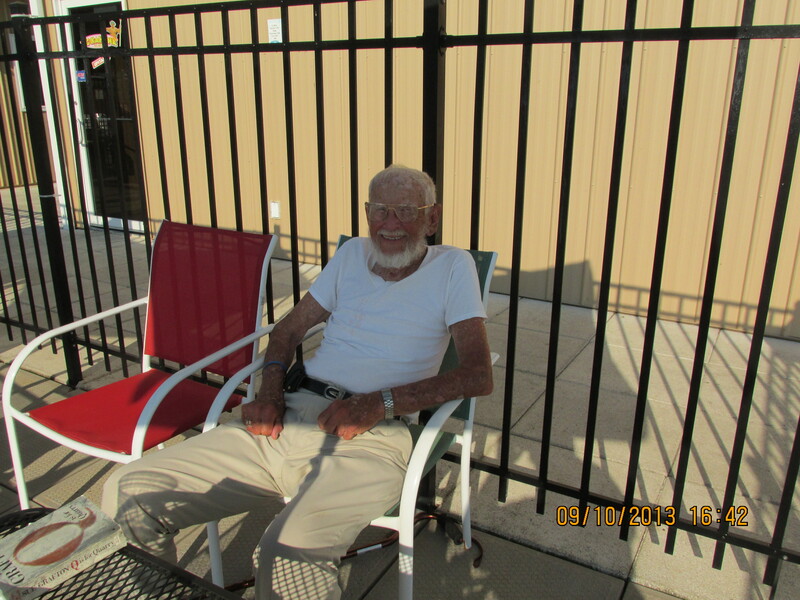 Dad enjoyed himself at the pool. Where are Dad’s bermuda shorts? Get some sun on those lilly white legs!!! Loving the beard. Hi Tom and Melissa, I met you at AGLCA rendezvous in Norfolk in 2012 and then a month later at the Monk rendezvous across the river where I had lunch on your boat . Have enjoyed your blog thus far, but sorry I only just found it recently. I would have enjoyed having you at our Marina on Lake Champlain and showing you how beautiful our lake is. 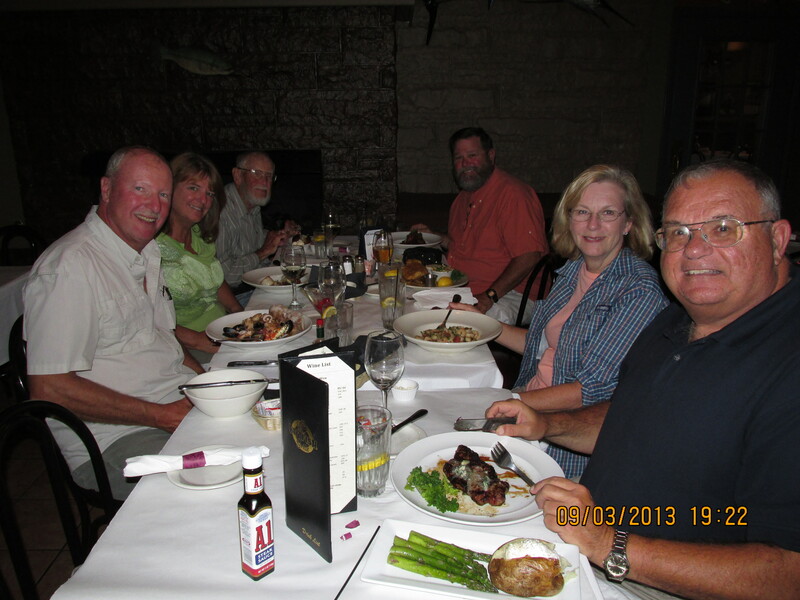 Going to meet with some friends of yours, Ted and Trish Mead, in Portland, Maine next week to look at their Monk 36. I believe they have kept their Monk near you in Oriental, NC. Looking forward to continue following you on your blog. Safe journey “Journey”.